Washington, DC. The National Society of the Daughters of the American Revolution (DAR) Memorial Continental Hall hosts the Washington Naval Conference also known as the Conference on the Limitation of Armaments or Washington Arms Conference. Japan, United States, Britain, France and Italy agree to limit the displacement and main armament of their capital ships, aircraft carriers and cruisers and to limit the total tonnage and age of their capital ships and carriers. Battleships and aircraft carriers are set at a ratio of 5:5:3 for the navies of Great Britain, the United States and Japan. Japan's Plenipotentiary at the conference is her Minister of the Navy, Admiral (later Fleet Admiral/Prime Minister), the Baron, Kato Tomosaburo. Though deemed necessary by the politicians, the terms do not sit well with the Navy Section of the General Staff. They embark on a design and research program to make their heavy cruisers, destroyers and submarines more powerful than other navies to compensate for numbers. Nominally, an attempt will be made to keep these designs under treaty limitations according to type. In this the Navy bureaucrats do not flinch from applying pressure to the Design Section to go ahead with potentially unwise innovations as well as sound ones. One of the most memorable results of reconciling these factors is the famous FUBUKI-class destroyers. Truly a ground-breaking achievement that attracts world-wide attention, the FUBUKI-class becomes known as `Special Type' destroyers. Listed as 1,680 tons they are concrete expression of the IJN's approach to treaty fleet size limits. London. The Treaty for the Limitation and Reduction of Naval Armament is signed by Japan, Great Britain and the United States. It is an extension of the Washington Naval Treaty of 1922. A number of existing or even nearing completion capital ships are to be disposed of or dismantled. (For example, battleships TOSA and KAGA. TOSA is a victim of the treaty, and undergoes a famous series of tests that contribute to the design of YAMATO; while KAGA herself, with AKAGI, are converted from big-gun ships to carriers for this reason.) The signatories agree not to build new capital ships until 1937. Perhaps more important at the time than its limits of tonnage per ship is its limits of total tonnage allowed a given type of ship. This latter aspect of the treaty produces remarkable outcomes to overcome it. A striking example arises regarding destroyer construction. Though the FUBUKI-class does not exceed the tonnage-per-ship limit imposed, which had actually been raised to 1,850 tons, the catch-22 for the Japanese is that overall destroyer tonnage is limited to 105,500 tons, or just under 71% of the U.S. Navy. In addition, only 16% of that number is allowed to be above 1,500 tons. In response, the Japanese engage in a number of creative attempts to circumvent the limits. A number of such designs for all classes of ships are drawn up according to the principals formulated. To describe an example that can serve for others: since the terms limit destroyer tonnage to 1,500 tons, but the Navy wants destroyers of comparable firepower to the `Special Type' FUBUKI-class, they come up with a way to pack this onto a lighter hull design. The result is the HATSUHARU-class destroyers which have only one 5-inch gun less than the FUBUKIs. One of the aft twin turrets is sacrificed, but in return for the first time with a Japanese destroyer, a super-imposed turret is placed at the bow, with a single rather than twin gun to reduce weight. The hull is made slightly wider and with a shallower draft. The upshot is a design that on paper at least, matches the `FUBUKI's and conforms to the treaty limits. At the same time the Japanese engage in another kind of end-around; that of expanding the role and power of ship-types not covered or much limited by the two treaties. One case concerns torpedo boats. Since the IJN considers the total destroyer tonnage limit too confining for its needs, it experiments with a new type of large 600-ton torpedo boat. Since this small warship type is not limited in its total tonnage by the treaty, the Japanese attempt to create a `mini-destroyer' - packing the heaviest punch they can get into a 600-ton hull. They will take over the patrol and port duties of fleet destroyers, freeing them for operations. The result is the CHIDORI-class torpedo boats. They emerge with an incredible (for their size) armament of four 21-inch torpedo tubes and three 5-inch guns - comparable to many destroyers and on a displacement registered as only 565 tons. The ingenuity of the Japanese in these achievements in adhering to, while also defeating treaty limitations, were widely, if grudgingly, praised overseas at the time. However, the result with ships that follow these principals such as the HATSUHARU and CHIDORI-class are ships whose area above water was very great in relation to below surface. Even to layman, they appear somewhat ungainly and top-heavy. That impression will receive devastating confirmation the year after the first ships of both classes make their 1933 debuts. Geneva, Switzerland. The Lytton Commission reports to the League that Japan violated Chinese sovereignty and should return Manchuria to China. At a Special Assembly, 40 nations vote that Japan should withdraw. Only Japan votes against it. Instead of returning Manchuria, Japan instructs its representative Matsuoka Yosuke (later Foreign Minister) to walk out of the League. After withdrawing from the League, Japan decides she will no longer closely abide by restrictions such as the Washington Treaty of 1922 and the London Treaty of 1930 that impose limitations on the number and size of her warships. Lip service will be paid to the terms initially, but the Japanese now routinely felt for instance they can add some 2,000 tons to a given destroyer design without being especially provocative. This aspect is applied to the new CHIDORI-class torpedo boats. CHIDORI’s sea trails indicate she is unstable and tends to list rather steeply in turns. With restricting tonnage less critical, bulges are added to the hull in an attempt to solve the problem. This increases displacement and cuts speed to 29 knots, but reduces listing to 20 degrees on turns. This is accepted. CHIDORI is commissioned and construction of her class, including TOMORUZU, continues. No changes in the still too heavy armament are made. On 24 February 1934, TOMOZURU is placed in commission. She too, had the new bulges added before commissioning. But in a few weeks the Japanese are to discover that the ambitious attempt to beat treaty limitations has been the proverbial too clever by half. In the early hours of 12 March 1934, IJN TOMORUZU, now assigned with her sisters to the 21st Torpedo Boat Squadron, is operating out of Sasebo near Terajima Strait for night torpedo training with sister CHIDORI and light cruiser TATSUTA. The cruiser is the flagship and serves as the target. The seas are mounting and southeast winds are blowing up. At first, the Japanese persist with the exercise and mock attacks, for bad weather must be expected at sea. However, the sea conditions greatly deteriorate. Wind speeds up to 39 knots and wave swells running so high that even TATSUTA is rolling 15 degrees while the two torpedo boats are constantly attaining a dangerous 30 degrees. It appears to be typhoon weather. This is the situation when at 0325 TATSUTA calls off the exercise and for all ships to head home to Sasebo immediately. The three ships struggle for home on a northeast course barely making 14 knots. But the storm blows even harder from the southwest, with winds increasing to 20 meters a second. Well before dawn the gusts are laying the torpedo boats over on their port sides as much as 45 degrees. Without warning just after 0412 TOMOZURU's lights disappear as she suddenly capsizes completely to port. So poor was the visibility among the waves and night darkness that not till daybreak do TATSUTA and CHIDORI realize TOMOZURU is missing. A search is launched, hampered by rain squalls and still heavy seas. At 1405 that same day, the search discovers TOMORUZU keel-up, but still afloat and drifting. More important, knocking can be heard from within the hull. The roll over had been so sudden that enough air is trapped in the hull to both keep it bouyant and men alive. Time is of the essence, but it is some hours before circumstances permit TATSUTA to lash tow cables on the upturned ship's propeller shafts and haul her stern first into Sasebo. They arrive at the harbor after sunrise on 13 March. Herculean efforts to both rescue trapped sailors and get the capsized craft into dock prove successful, but only one officer and twelve men are rescued in time. The last of them is brought out of the docked hull in the predawn hours of 14 March. The bodies of CO LtCdr. Iwase Okuitsu and five officers are among the seventy-two men found drowned or suffocated within the wreck; another 28 are missing, believed to have been swept overboard the night of capsize and lost at sea. An investigation committee, headed by Admiral Nomura Kichisaburo (26), later Ambassador to the USA at the time of Pearl Harbor, is appointed and investigates the wreck, reporting to the Navy Minister on 2 April 1934. The investigation determines the cause of TOMORUZU’s capsizing to be high metacentric height. The design's reduction of hull and machinery weight while carrying heavy armament topside had dangerously raised the center of gravity. At the time of her capsizing, she was low on fuel and water that would otherwise have helped keep this metric lower and at a safer level. The full load of munitions she carried aggravated the top-heavy problem. With these considerations in mind an investigation committee, headed by Admiral Kato Hiroharu (18) (former Chief, NGS), sets up a series of measures to improve their seaworthiness. The four completed ships have to be rebuilt: two of the 21-inch torpedo tubes are removed, and ammunition carried and superstructure reduced. The three 5-inch guns give way to lighter 4.7-inch turrets. These downgrades so reduce their offensive capability that they can no longer be regarded as suitable for their envisioned `mini-destroyer' style role. The design is thus a failure. (Though the first four later give sterling service in convoy and coast defense role.) The 16 planned CHIDORI-class torpedo boats are canceled before they are laid down and the lessons incorporated in the succeeding OTORI-class. The disaster, which becomes known as the "TOMOZURU Incident" had arguably mainly been a consequence of the often unrealistic demands of Navy General Staff's bureucrats seeking to duck treaty limits, but the blame falls on Rear Admiral Fujimoto Kikuo, head of the IJN's Technical Department’s Basic Design Section. Particularly telling was the criticism of his predecessor and mentor, the still influential Vice Admiral Hiraga Yuzuru (1878-1943). Hiraga charged that Fujimoto's ambitions had led him into adopting untried and unproven technologies (such as electric welding) and allowing excessive center of gravity (OG) values for new warship designs. The two men already had a bitter feud going on regarding the design of the future YAMATO class and other issues. Now the TOMOZURU Incident tipped the scales in Hiraga's favor. (His views now prevailed on a number of points - for example Hiraga favored riveting and after 1935, hull welding was almost entirely abandoned as will be seen.) Fujimoto is thus scapegoated and dismissed in November 1934. Heartbroken, he dies two months later. The fate of the TOMOZURU, and by implication the `pack as much on as light hull as possible' philosophy forces the IJN to take a long second-look at the stability of warships under construction under the Second Replenishment Program. Furthermore, warships nearing completion from the First Replenishment Program of 1931 - if they had not yet launched - are to have stability improved at the last minute as much as circumstances allow. Finally, for those ships already completed or in service, careful inspection is undertaken with measures of removing topside weight where indicated. The just launched first two MOGAMI-class cruisers are examples of these last two categories. Their bridge height is lowered and other topside elements like an existing hangar removed or re-shaped. Another is new carrier RYUJO. Four 12.7cm gun mounts are removed, and bulges and keel added to improve stability. The HATSUHARU-class destroyers lose their controversial superimposed single turret forward which is moved aft and one of their two torpedo mounts is deleted. Additionally, a large number of warships received a fixed ballast to improve stability. The carriers RYJUO and HOSHO received 567 and 726 tons respectively. Most 5,500 ton light cruisers received 230 tons apiece, though this varied according to special needs with KATORI requiring 587 tons, and so on. With measures underway to correct the top heaviness of some of the new over-bold designs, it is assumed the design issues are comfortably moving toward resolution going into the next year, 1935. However, that impression is gainsayed by further "incidents" on full power trial runs of new warships that spring and summer. On 20 March 1935, the ambitiously designed and powerful MOGAMI, the first of four of a new class with an all-welded hull, commenced full speed trials in the Bungo Straits. The design had been altered after the TOMOZURU incident, but what now occurrs is another major setback. After the completion of the runs in early April, it is found that frames in the fantail have been distorted, plates loosened, and fuel tanks ruptured. Bow plates have bent and the overall hull itself warped from the wave action so that No. 3 and No. 4 turrets are rendered unable to train. Emergency repairs are undertaken, but no major changes instituted. 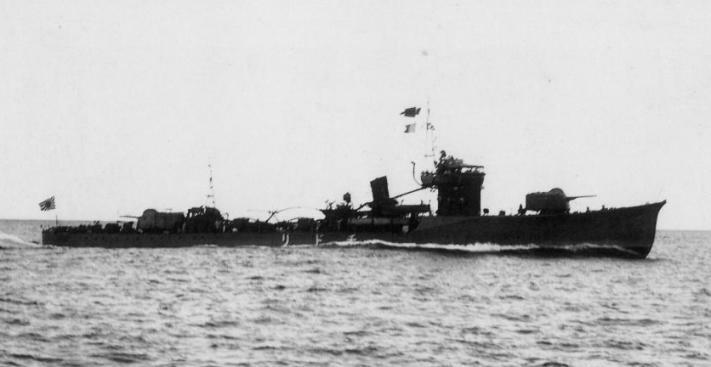 A similar event occurs on 12 August 1935 as the FUBUKI-class destroyer MURAKUMO of Desdiv 12 is running the standard high speed trials in Tokyo Bay. With little warning there came the sound of grinding and buckling and it is necessary to cut speed. The trial run is abandoned, and MURAKUMO returns to port. As she arrives it is obvious there is dangerous hogging amidships and the joints at the prow forward of the bridge have split. Examination shows apparently longitudinal integrity in the hull design fore and aft, and strength at the bow and amidships, are inadequate, resulting in compression and buckling forward. For one reason or another, it is apparently concluded to be a case of flawed construction for MURAKUMO in particular, as no move is made to look at the overall building program and limited remedies proposed were not carried out. The warning given by the incident is not properly heeded. It remains for Mother Nature to re-apply and drive home the lesson decisively just seven weeks later. On 26 September, 58 ships of the Combined Fleet depart Hakodate and steam into the rough northwest Pacific waters to conduct the concluding rounds of the exercises begun July 20. The mock engagements will take place between Honshu and the Kuriles. For the exercise, the First and Second Fleets as Blue Fleet will grapple against a temporarily organized `Fourth Fleet' as Red Fleet. Near dawn the Red or "Fourth Fleet" is about 100 miles off the east coast of Northern Honshu and steering southerly when it is alerted that a large typhoon has blown up to the south and is advancing toward them at 70-80km/hour over a 200 mile front. There is neither time nor sea room to get clear of such a wide storm, so the Fleet has no choice but to batten hatches and attempt to ride it out. Course is maintained heading obliquely into the storm, and speed cut to 10 knots. A situation analagous to the famous Typhoon Cobra that struck the USN's Task Force 38 off Luzon in December 1944 now ensues. Moving rapidly northeast the center engulfs the fleet at about 1300 hours. Sustained wind speeds of 79 knots are recorded with wave heights from 45-60 feet. The conditions are tailor-made to put the strength of the new structural designs and construction methods of the Imperial Navy to maximum test. From the fleet's big carriers to its destroyers both categories are found wanting. The forward part of HOSHO's flight deck is wrecked, and the bridge located under the overhang there is smashed. HOSHO also loses steering for a time. The bridge of the newer and larger RYUJO, also at the head of the ship and under the flight deck, is stove in. The windows are warped at the corners at both the port and starboard sides. The pounding seas also breach seams in the shell plating, and RYUJO's hangar deck experiences flooding. There were no battleships present, but the powerful new heavy cruisers MYOKO and MOGAMI also suffer major structural damage. MYOKO had rivets amidships loosened and several compartments consequently flooded. However the the damage was relatively minor, and it would be noted how riveting had stood the stresses of the storm better. MOGAMI again has distortion similar to what had happened in March - the forward part of the ship buckling from ruptured welds so the forward turrets became unuseable. Sister-ship MIKUMA suffers similar, but less severely. The hull of the big submarine tender TAIGEI -- (in the future converted to aircraft carrier RYUHO) -- develops serious cracks in her all-electrically welded hull. Minelayer ITSUKUSHIMA's frame is so buckled that she comes close to being a constructive total loss. As it is the repairs are so extensive as to almost constitute a full rebuild as her welding is replaced with riveting. Worst of all was the stresses and ordeal endured by the destroyers. Some of the fleet's FUBUKI-class report rolls up to 75 degrees. That they had not capsized like TOMOZURU is a miracle. But terrible damage is suffered nonetheless. The storm had been at its height for nearly an hour and half when at 1410 a wave crushes the bridge of MUTSUKI, damages the forward tubes, and No. 2 funnel. Sister-ship MOCHIZUKI also has her bridge crushed. AKIKAZE's bridge is warped by waves as well. The bigger "Special Type" FUBUKI-class suprisingly fares worse. Around 1400 YUGIRI's bridge windows are also smashed. She struggles on, but at 1602 the entire bow section forward of the bridge snaps cleanly right off as if severed by a knife. She loses 21 men. HATSUYUKI is similarly battered and at 1729 while riding atop a high pyramidal waves, HATSUYUKI's bow too, shears off. Much like with YUGIRI, the forward turret and all carried away just forward of the base of the bridge and the port lifeboat there is left dangling from its davits precariously over a vertical drop into the sea. Twenty-eight of her company are missing. The point of break on both FUBUKI-class destroyers is so neary identical as to look the same in photographs; a clear indicator of a common weak point. After losing their bows both destroyers have to wallow helpless in the troughs until the storm lessens. Only then can tows be arranged and the two bow-less destroyers able to be towed home, stern first. Another of the class, USHIO, had a close-call: her entire fantail was so weakened it was likely it would have broken off had the typhoon lasted longer. As many as thirteen other destroyers - SHIRYUKI, USUGUMO, MURAKUMO, SHIRAKUMO, AMAGIRI, OBORO, AKEBONO, KIKUZUKI, MINATSUKI, HOKAZE, YUZUKI, HARUKAZE and ASAKAZE - are damaged and beat up by wind and wave, albeit to less degree. A total of 54 sailors are missing or lost between all the ships, most of them from YUGIRI and HATSUYUKI, and five from other ships. Some 60 men are injured, including ComDesdiv 30 aboard MUTSUKI. The Blue Fleet is not caught in the storm's path, but as damage to the Red [Fourth] Fleet is assessed and further reports come in, the maneuvers are officially canceled. This storm disaster and ordeal is dubbed "The Fourth Fleet Incident." The NGS spares no time in investigating. With several warships under construction any flaws must be quickly identified and recommendations for fixing them heard. Another investigation committee, again headed by Admiral Nomura, later Ambassador to the USA at the time of Pearl Harbor, is convened. Among its members is then Vice Admiral (Fleet Admiral, posthumously) Yamamoto Isoroku (32)(later CinC, Combined Fleet) and Rear Admiral (Fleet Admiral, posthumously) Koga Mineichi (34)(later CinC, Combined Fleet).The committee also takes into account the related lessons of the TOMOZURU Incident earlier, and expands on them as well. In April 1936 the group presents its findings and recommendations for immediate changes in warship design and construction principles. Where the typhoon is concerned, the main villains appear to be the length-to-height ratio of 10 to 13 of waves at the heart of the storm. Existing designs had pre-supposed ratios of 20 when fabricating hull strength. Bows had simply broken off when perched atop waves. Also notable are the weaknesses in the longitudinal strength of the FUBUKI-class and others, that had already been foreshadowed by the incidents earlier in the year with MURAKUMO and MOGAMI. These weaknesses could snap hulls when they sagged or hogged (bent up in the middle) amidships while riding mountainous waves. The primary culprit in these defects is generally found to be the still developing practice of electric welding of hulls. TAIGEI and ITSUKUSHIMA built this way particularly show these stresses, as does the MOGAMI-class cruisers. Though welding is thought to save as much as 15% of weight in a ship, the technique is suspended except for specified areas and subsequent warship building reverts to riveting for longitudinal beams and the bulk of amidships shell plating. For already exant ships, fore-and-aft integrity is increased by adding more steel plates atop existing plates through the hull's longitudinal axis. The TAKAO class is improved in this manner. To solve the related design issues that caused instability, a number of weight removal and stability enhancement measures are undertaken. Where possible topside hamper, weaponry, and volume of munitions carried are reduced to increase metacentric height. Loading ballast or fitting ballast keels in smaller vessels and attaching external bulges on large units is implemented. Adequate pumping means to increase ballast as called for is also mandated. The best example of radical changes of this nature other than the CHIDORI-class are the new MOGAMI-class cruisers. In 1936, the MOGAMI and MIKUMA ae put in reserve status and remodeled again. More superstructure is reshaped, the mainmast reduced in height and the recommended changes such as external bulges fitted, even though these increase displacement by a full 1,000 tons more. Since SUZUYA and KUMANO are not yet yet complete, the changes are easier, and that goes even more for their future cousins, the TONE-class. Carrier RYUJO once more goes into the Navy Yard, and among other changes emerges with her forcastle raised one deck. HOSHO has her funnels modified and fixed in the sideways position. All this results in delays of some years of planned new building for the IJN as resources turn to a vast program of enforced modifications to strengthen or correct faulty designs. Expensive and time-consuming, the revamping of warships for the IJN proves a blessing in disguise. Because of their mid-decade timing, the peace time setbacks and mishaps of 1934 and 1935 expose in advance flaws and seaworthiness issues in new ships of the fleet. Weaknesses that otherwise likely would have gone undetected, only to be revealed later under the stresses of the Pacific War. The insights gained are every bit as important as those being gained at the frontline in China in this period. Like the old Mongol saying "that which does not kill you makes you stronger" the IJN emerges from the 1930's all the more fit and girded for the demands of the future. A telling lesson of the importance for militaries to not internally suppress embarassments and to fully investigate and act upon the facts when peacetime mishaps offer warning of hidden pitfalls.